Glass of bacon water please! What if water tasted like bacon? Drop one tablet into water and it begins to dissolve creating bubbles that will infuse the water with the new flavor. Don't limit your self with water, as these will work with any liquid. 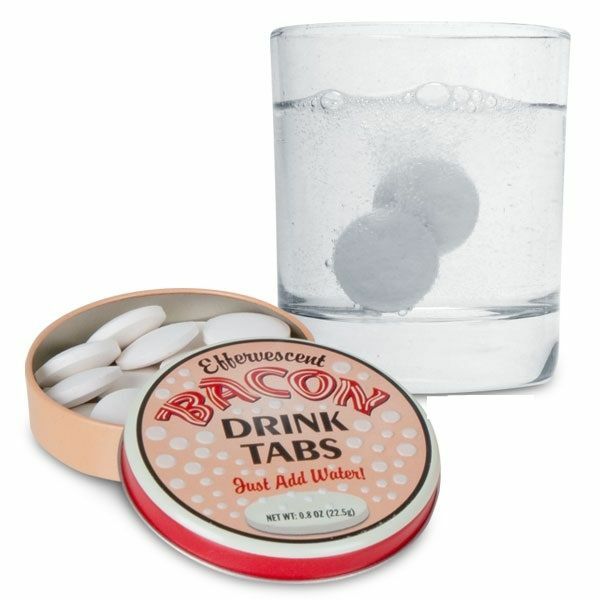 Bacon drink tablets are great for pranking, drop one to your friends drink and watch when he goes to the counter to whine that he's drink tastes like bacon. The bacon tablets are served in fine tin and one tin contains about 15 tablets.